84.35/100 on Whiskybase is a fantastic score and refers to the new 2016 version. The 2014 bottle scores 82.59/100 so perhaps Tomatin have made some improvements to the Port Casks mix, or maybe the lovely bottle enhances the drinker’s enjoyment of the contents. It’s surprising how subtle things like that can make a difference to how something tastes. A quality presentation makes you anticipate a quality product. Nose: Quite a powerful nose. Big bunches of red berries and grapes. Vanilla, oak and hints of white pepper. Palate: Dark chocolate dipped in strawberries. Crushed almonds, walnuts, Victoria sponge (with jam and cream in the middle) and a centre of oak. Finish: Fruity on the finish. Cu Bocan is Tomatin’s brand name for their new line of non-aged statement (NAS) whiskies, which most distilleries are doing these days. It was the only version of Cu Bocan when it first appeared in the Whisky Bible 2014 but the 2016 edition has 5 versions. The one that scores the most is the ‘1989 Vintage’ with 95.5/100 but the ‘Virgin Oak Edition’ is only one behind with 94.5/100. Clearly the author, Jim Murray, is a fan of what Tomatin are doing. 85.5/100 for my original Cu Bocan classifies this dram as “very good to excellent whisky definitely worth buying”. Mr Murray’s review includes “an old fashioned dram: the type that Pitt the younger, or Pitt the embryo might remember…and appreciate.” About the taste he remarks “the big player is the oak which, almost, bourbon like, shovels cartloads of caramel and muscovado into the mix.” Any whisky worthy of a quote from Blackadder must be good! 81.5/100 is a good score on Whiskybase where one voter says of the taste “mildly peated and ashy, with a faint sherry influence and exotic fruits”. This Tomatin is part of the 24 x 20cl bottles that make up the Carn Mor Vintage Collection. Distilled in 1987 and bottled in 2011, it’s from a limited edition of 960, Cask No: 494. Non-chill filtered, no added colour and 46%, so the makings of something very delightful! Certainly the 6 members who rate it on Whiskybase think so because nearly 83/100 is a very good score. Thankfully several Whiskybase voters have left their thoughts about this single malt, which include “not bad as a Sunday afternoon drink but this whisky could better be used for a blend”, “faint summer (berries) and orchard (cooking apples) fruits, alongside cereal notes, mingle with raw spirit and a hint of cardboard. Fiery and unrefined on the palate, even after the addition of water. Medium-length finish, with a bit too much bitterness. If tasted blind I would never have put this as a 20+yo malt!” and “the palate is complex, with notes of white fruit, baking spice, dried herbs, and a lingering sense of weed. Every time I have a dram I am transported to an Amsterdam coffee shop in off hours.” With a summary of “I like it very much”. Weed? Seriously? I can’t say it’s a smell I’m familiar with but it goes to show how different people find different things depending on their experiences. This Tomatin is at least 23 years old so it has had a lot of maturing, even if one reviewer found that hard to believe. It’s clearly got a lot going on and an interesting whisky to try. Because Facebook knows exactly what my interests are, I get various adverts that relate to whisky. One that caught my eye was from ‘Malts of Scotland’ whose website I’d visited many months before. All I could remember about them was their interesting bottle shapes, although these are only used for some of their output (sadly not this Tomatin). I ‘liked’ their Facebook page and it was here that I saw their offer on 3 different malt whiskies – “£40 each and free next day postage”. One of the three was this Tomatin 19yo, cask strength at 53.8%. Whiskybase include 4 previous bottlings of Tomatin by ‘Malts of Scotland’ (here) all of which score very highly. Two between 85-90/100 and two above 90/100, which is exceptional. Whiskybase list my 19yo under Malts of Scotland’s new name (Bartels Rawlings International Ltd, or ‘Bartels Whisky’) where one voter gives it 87/100 and summaries with “this is a refreshingly different and yet fabulous ‘old style’ central Highlands find”. It used to be the case that buying from an independent bottler meant good value but the price gulf between distilleries and independents has closed in recent years. So it’s nice to see that bargains can still be found, even if finding them is like a needle in a haystack. Overall, the service from ‘Malts of Scotland’ was excellent, and I’ve subsequently ordered from them again. Having bought a full bottle of the Tomatin Legacy, which scores 94.5/100 in the Whisky Bible, I wasn’t really looking to get any more Tomatin for a while. But, fate intervened. Which reminds me, I need to have some strong words with fate because it keeps costing me money! I stumbled across Nickolls & Perks selling a half bottle of the Tomatin 25yo for £40, which seems a good price for its age. Time for some research! The cheapest 70cl bottle I could find was £160, so £40 was looking even better. I found an identical half bottle that had sold at auction in January 2014 for £60, which suggests a good investment. I then read in a Whiskybase review from 2012 that the 25yo wouldn’t be around for long because it was being replaced by the 30yo (which my cousin told me is also being discontinued). I looked around online and, sure enough, Nickolls & Perks are the last place selling it. 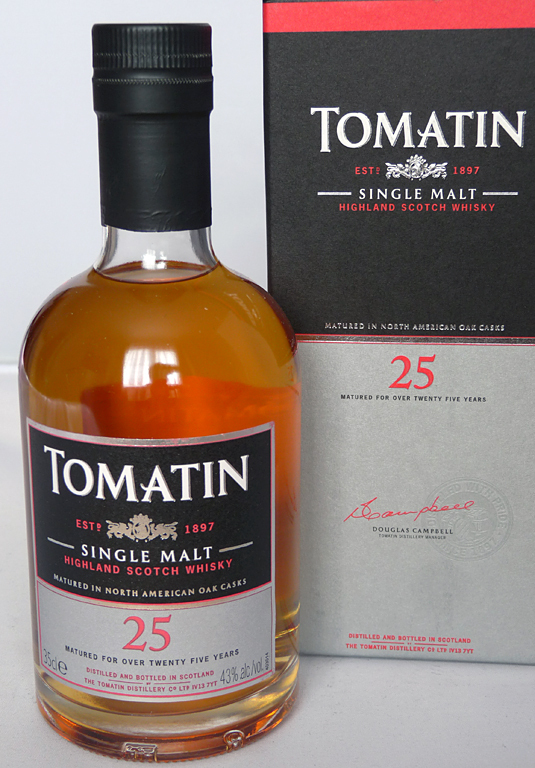 Jim Murray’s review of the Tomatin 25yo in his Whisky Bible 2014 is very short and sweet saying “not a nasty bone in its body: understated but significant.” He had more to say in 2013 but he cuts back on the words when a whisky gets discontinued. 87.7/100 on Whiskybase is a fantastic mark from 35 votes. All-in-all, a fabulous malt for drinking or as an investment. But if you’ve not tried Tomatin before and can’t find the 25yo I’d recommend the NAS ‘Legacy’ which is excellent for taste and for price. 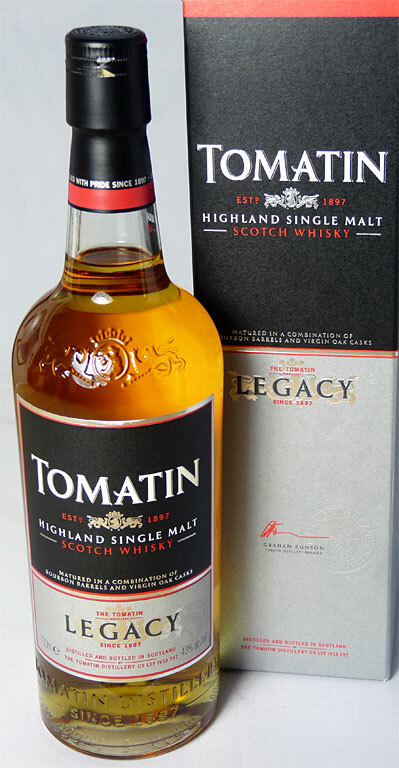 Tomatin Legacy is a new addition to the Whisky Bible this year, having been launched by the distillery in 2013. According to Tomatin’s distillery manager Graham Eunson, the name “Legacy” is to honour the history and traditional processes the distillery has, including it’s own on-site cooperage. Legacy is unique in the Tomatin range for being matured in virgin oak casks to add extra depth of flavour after aging in bourbon casks. It certainly sounds different, and it’s good to see one of the less fashionable distilleries making their presence felt on the world stage. Jim Murray says of the Legacy in his bible review “a dram of rare mouth-watering quality… makes you want to gasp with pleasure”. 94.5/100 puts this whisky in the bracket of “superstar whisky that gives us all a reason to live”. Of the 29 different versions of Tomatin that are reviewed in the whisky bible, only two have a higher score than the Legacy, both of which are 34-years-old and would cost a fortune. The Legacy was a very modest £23. The Whisky Bible rating suggests this malt is “good to excellent and definitely worth buying” and 78/100 is a good mark from the Malt Maniacs. Combining these two sources it means you’re unlikely to be disappointed with this Tomatin 12yo. And I love the tall, slender bottle it comes in! This miniature has a glass bottom about 1cm thick which adds something to the style, and a lot more to its strength. Not that I intend to test it by dropping it on a hard surface. Maybe when I’ve drunk it I’ll change my mind with the empty bottle!